Finished hypoid 38" gear set for a paper pulper cut by 3/16 ball end mill. 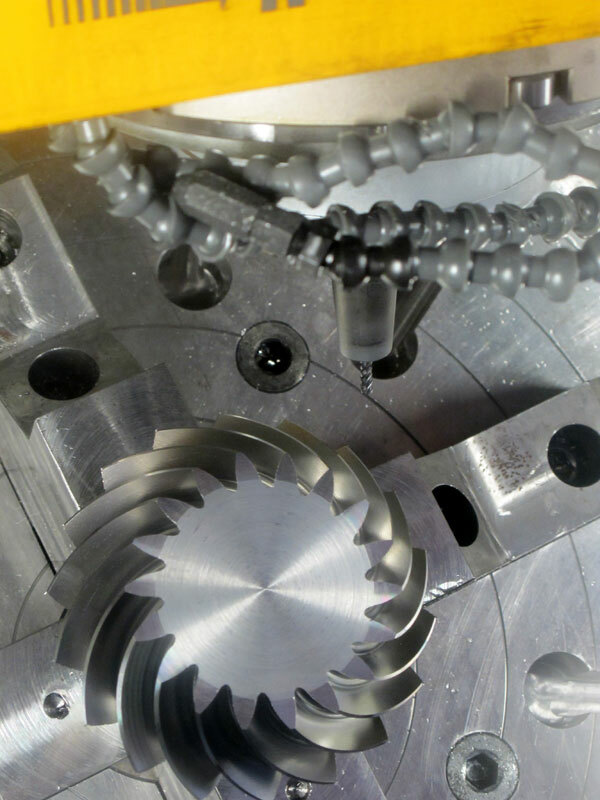 Large spiral bevel gear for a rock crusher cut on 3-axis CNC. Ring gear is case hardened to HRC 58, and finish cut with carbide 1/2-inch ball end mill to AGMA Q12 after case hardening. 24"OD pinion is case hardened to HRC 62 after finished cut. MP1000 rock crusher gear cut on Gleason gear generator on upper picture, and the same gear cut on 3-axis universal CNC milling machine. Our software was used for reverse engineering of the original Gleason tooth cut, for accurate 3-d tooth modeling, and for tooth contact verification. Small machine shop in USA takes delivery of 3 axis CNC from China to cut up to 180-inch diameter AGMA 12 case hardened spiral bevel gears using our software.